The Newest CIJ from LEIBINGER, the JET One offers the best quality product, the highest level of reliability and an unique and broad set of features to run your production line more efficiently than ever. The JET One is a high performance (CIJ) inkjet printer ideal for daily tasks when marking different materials, products and surfaces . The JET One prints fixed and variable messages such as best before dates, lot numbers and even graphics. Various product surfaces do not pose a challenge for the LEIBINGER JET One inkjet printer, regardless of whether they are convex, concave, rough, smooth, flat or structured. Non-contact marking and fast product processing make CIJ technology the most flexible, dynamic, versatile and cost-effective method of marking products. The LEIBINGER JET2neo high performance (CIJ) inkjet printer is the ideal marking system for daily tasks when marking different materials, products and surfaces . The JET2neo prints fixed and variable data such as text, barcodes, expiration dates, lot/batch numbers, 2-D codes, shift codes or graphics without contact and during ongoing production with fast-drying inks. Various product surfaces do not pose a challenge for the LEIBINGER inkjet printer, regardless of whether they are convex, concave, rough, smooth, flat or structured. Non-contact marking and fast product processing make CIJ technology the most flexible, versatile and cost-effective method of marking products. 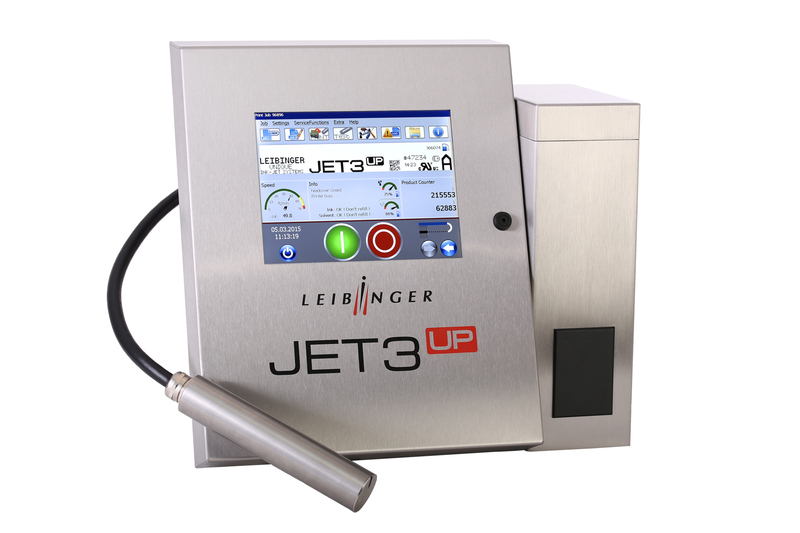 The LEIBINGER JET3up industrial inkjet printer is the perfect solution for all your product marking requirements. Products and materials such as glass, films, cans, cardboard, cables, wood, plastics, metal and steel are marked without contact by the JET3up continuous inkjet printer (CIJ) during production. Various product surfaces do not pose a challenge—convex, concave, rough or smooth—can be marked with fixed and variable data including expiration dates, LOT/batch numbers, serial numbers, barcodes, 2D codes and graphics. The Linx 8900 small character inkjet printer provides simple and reliable operation improving your production line efficiencies. The printer boasts a large, icon-driven high-resolution touch screen for error-free message creation and operation. Fluid refills are a breeze with the simple, one-touch fluid cartridge system. This means no mess, no tools and no mistakes. The 8900 is armed with Linx’s industry-leading printhead which is completely sealed for reliable performance and only requires cleaning approximately once every three months. And regular maintenance is easy with the on-screen wizard that guides the user through an quick 30 minute, engineer-free service interval typically needed only every 18 months. Real-time measurements, on-screen production rates and customizable logs help you track your production efficiencies. The Linx CJ400 small character inkjet system prints up to three lines of information such as lot and date codes, times, text and other data onto most porous and non-porous substrates moving on a production line. The automatic message set-up feature with line speed measurement allows for quick, easy message creation and changeover and consistent print quality. The Easi-Change® service feature makes the printer simple and inexpensive to maintain because no technician is required for standard maintenance. At less than 30 pounds, the CJ400 is the lightest weight printer in its class - ideal for applications and uses that call for portability. Put it where you need it, when you need it. Request more info today! The Linx 5900 inkjet printer offers the flexibility to adapt to your changing production needs with a low total cost of ownership. The 5900 printer prints up to three lines of information at speeds up to 1433 feet per minute allowing for maximum output when needed. With message storage at 1000 messages and auto date creation, user interface is fast and efficient. Additional time and cost savings are rendered by the extended service intervals of 6000 hours. And there is no stop in production necessary when fluids need to be refilled. The mistake-proof refill system can be utilized on the fly. Experience even more uptime with the adjustment-free printhead with no exposed wires and minimal maintenance required. The Linx 7900 continuous inkjet printer offers a full range of automatic set-up features that help you reduce code error and increase productivity. The 7900 line of printers include additional features as standard, providing extra value when more advanced capabilities are required. The Linx 7900 prints up three lines of alphanumeric code, logos, barcodes and 2D codes. Robust software and hardware features allow easy connectivity to peripherals, conveyors and other equipment including remote monitoring from a smart phone and/or PC, providing easy integration into an automated plant floor and access to data. The Linx 7900 printer comes with an 18 month warranty. And the intelligent ink system provides up to 9000 hours between service intervals delivering real uptime.